Welcome to a special sponsored podcast discussion coming from The Open Group’s 23rd Enterp rise Architecture Practitioners Conference in Toronto. 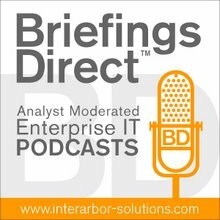 This podcast, part of a series from the July 2009 event, centers on the fast-changing role and expanding impact of enterprise architecture (EA). The enterprise architect role is in flux, especially as we consider the heightening interest in cloud computing. The down economy has also focused IT spending to seek out faster, better, and cheaper means to acquire and manage IT functions and business processes. As service com ponents shift in their origins and delivery models, the task of meeting or exceeding business requirements based on these services becomes all the more complicated. Business outcomes and business processes become the focus, yet they may span many aspects of IT, service providers and the business units and partners/suppliers involved. The new services era calls for powerful architects who can define, govern, and adjust all of the necessary ingredients. This new process czar role must creatively support and improve a business process lifecycle over many years. Yet who or what will step into this gulf between the traditional means of IT and the new cloud ecology of services? The architect's role, still a work in progress at many enterprises, may well become the key office where the buck stops in this new era. What then should be the role, and therefore what is the new opportunity for enterprise architects? Here to lead the way in understanding the evolving EA issue, we're joined by our panel, Tim Westbrock, managing director of EAdirections; Sandy Kemsley, an independent IT analyst and architect; and John Gotze, international president for the Association of Enterprise Architects. The discussion is moderated by me, BriefingsDirect's Dana Gardner. Kemsley: I work a lot with companies to help them implement business process management (BPM) solutions, so I get involved in architecture things, because you're touching all parts of the organization. ... A lot of very tactical solution architects are working on a particular project, but they're not thinking about the bigger picture. ... In many organizations, architecture is not done all that well. It's done on an ad hoc basis. It's done at more of the deep technical level. I can understand why the anti-architecture people get frustrated with that type of architecture, because it's not really EA. Westbrock: The more strategic enterprise architects depend on the strategic nature of the executives of the organization. If we're going to bring it into layers of abstraction, they don't go more than a layer or two down from strategy. ... One of the good transformations, or evolutionary steps that I have seen in enterprise architects is less of a technology-only focus. Enterprise architect used to be synonymous with some kind of a technology architect, a platform architect, or a network architect, and now you are seeing broader enterprise architects. Gotze: [The down economy] is helping to change the focus in EA from the more tactical to the more strategical issues. I've seen this downturn in the economy before. It's reinforcing the changes in the discipline, and EA is becoming more and more of a strategic effort in the enterprise. Westbrock: I still don't think business architecture is within the domain of most IT enterprise architects. ... There are some different drivers that are getting some organizations to think more holistically about how the business operates. ... Modeling means we need architects. We're getting involved in some of these more transformational elements, and because of that, need to look at the business. As that evolves more, you might see more business ownership of enterprise architects. I don't see it a lot right now. Kemsley: In many of the companies that I work with ... there is this struggle between the IT architects and/or the enterprise architects, who are really IT architects, looking at, how we need to bring things in from the cloud and how we need to make use of services outside. They're vowing to have all of that come through IT, through the technology side. This puts a huge amount of overhead on it, both from a governance standpoint, but also from an operational standpoint. That's causing a lot of issues. If you don't get EA out of IT, you're going to have those issues as you start going outside the organization [for services]. ... It's the ones who are starting to regenerate their architect community internally -- both with business architects and with architects on the IT side -- who can bring these ideas about cloud computing. [It's about] using business process modeling notation (BPMN) that can be done by the business architects and even business people, as opposed to having all of that type of work done in the IT area. Gotze: The IT department will not disappear, of course. It's naive to say that IT doesn't matter. It's not the point that IT is irrelevant or anything, but it's the emphasis on the strategic benefits for the enterprise. The whole notion of business-IT alignment ... is yesterday's concern. Now it's more about thinking about the coherent enterprise, that everything should fit together. It's not just alignment. You can have perfectly well aligned systems and processes, without having a coherent enterprise. So, the focus basically must be on coherency in the enterprise. Westbrock: I don't think that this is a new problem. ... The difference between '80s and '90s and now is that it's not a chain with seven big links. It's an intricate network with hundreds, if not thousands of pieces. ... That adds complexity an element of governance that we need to mature toward. ... Where is that expertise going to come from? How are we going to capture which vendors that popped up this week are still going to be around next week? Kemsley: The ones that can handle this new world of complexity well are ones that can bring some of the older aspects of governance, because you still have to worry about the legacy systems and all of the things that you have internally. You're not going to throw that stuff away tomorrow and bring in some completely new architecture. But, you need to start bringing in these new ideas. Gotze: There will be a standardization and certification [process for architects]. That will not go away. ... [But it's at] the strategic level of architecture where you must have an emphasis on innovation and diversity to make it work. ... It will be some kind of hybrid model. Look at how government is working with it. What's missing is somebody with this portfolio, meaning holistic, enterprise-wide view of what services we need, what services we have, where we can go get other services -- basically the services portfolio. Enterprise architects are uniquely positioned to do that justice. They are enterprises after all -- it's not just the private sector. There's much more emphasis in government about getting all the agencies and departments to work together and to understand each other. Westbrock: We're still decades away from any kind of maturity in the business architecture space, whether that be method, process, or organization. But, we're now at the point where more standardization in the applications or solutions and the data or information layers is going to help us with this particular challenge that's facing enterprise architects. ... I don’t think that the expectations for most enterprise architects are to enable business transformation. In most organizations that I deal with it’s to help with better solutions here and there. It’s to do some technology research and mash it up against business capabilities. It’s not this grand vision that I think most of us have as enterprise architects in the profession of what we can accomplish. Kemsley: I don’t see the business leadership clamoring to take over architecture anytime soon. ... You're not going to get the CEO coming in and saying on day one, "Oh, I want to takeover that architecture stuff." Gotze: That’s also because we in the profession have managed to create a vocabulary that's nearly impossible-to-understand for people outside the profession. I think the executive leadership will want to take over the work that the strategic EA is doing. They might not call it EA, but they will be the ultimate architect. The CEO is the ultimate chief architect for a forward-looking and innovative enterprise. Kemsley: We have to learn to use EA power for good, rather than evil, though. In a lot of cases, it’s just about implementation. It’s sort of downward looking. Enterprise architects tend to look down into the layers rather than, as Tim was saying, feed it back up to the layers above that. They have that deep technical knowledge, because they've done that a long time. They've become experts in that silo. ... [But] the folks that are going to be called to function as enterprise architects are folks that need a much broader set of skills and experience. Westbrock: The folks that have been successful are the ones that take the time to do two things. They build artifacts and processes that work down, they build artifacts and processes that work up, and they realize that they're different. You don't build an artifact for a developer and take that to a member of the board. You don't build project design review processes and then say, "Okay, we're going to apply that same process at the portfolio level or at the department level." ... There is a huge opportunity for enterprise architects relative to not just the cloud. The cloud is just one more of the enablers of service orientation, not SOA, but service orientation. Somebody needs to own the services portfolio. Maybe we're going to call them the "Chief Services Architect." I don't know. But, what I see in so many organizations is service oriented infrastructure being controlled by one group, doing a good job of putting in place the kinds of foundational elements that we need to be able to do service orientation.